One of my biggest struggles with trying to improve my life relates to diet and exercise. I mean, I think everyone WANTS to be fit and healthy, but actually wanting it badly enough to put down the bar of chocolate and pull on the running shoes? Nah. But I have a child now; I HAVE to make it a priority. I can’t be the mother huffing and puffing around the place when she brings her daughter for a kick-about in the park. And I can’t set a bad example for Scout (yes, that’s her name, and yes, I’ve heard all the rude comments before, thank you very much). I can’t get heart disease or diabetes, or any other avoidable affliction. My current level of fitness is… I dunno, what’s below non-existent? Normally when I go through a “get fit” phase (January 1st – 5th-ish), I focus on cardio. This time, I’m going to focus on strength training. And now for the embarrassing confession part of the programme — I can’t do a single push-up. Not one. My arms are way too weak to lift my own body weight. If you’ve read my “Start Here” series, you’ll know I’m not about “go big or go home” when it comes to making changes. In fact, in this case, I’m pretty sure that if I “went big”, it wouldn’t be home I’d be going to, it’d be the hospital. So my goal is one push-up. 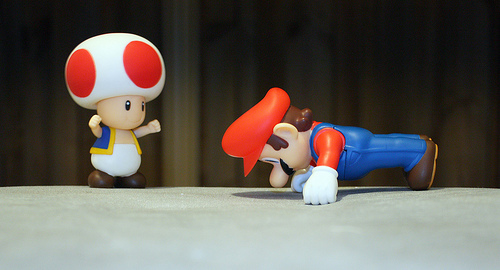 That’s right, one measly push-up. Within a week. That should be doable, right? Those of you who think I’m starting too small might want to consider that everyone has to start somewhere, and that that starting point is usually a platform for bigger and better things. So I’ll start with one, and see how I go. I could just as easily say I’ll aim for 10 push-ups in a week, but how realistic is that if I can’t even do one right now? And, of course, I have a plan. I can’t just sit back and magically hope that, by the end of the week, I’ll be able to lift myself off the floor. No, the plan is to do modified push-ups (knees on the floor instead of feet) to build up a bit of muscle first. I started Monday, and managed just 2 modified push-ups. (The shame!) Tuesday, I did 8; Wednesday, 14; and yesterday, 20. So yes, I’m still as weak as a (very weak) kitten, but I’m making progress. And that’s better than where I was last week. And I know I’m not the only one in need of a fitness fix, so why not join me? Commit to one SMALL thing, put a plan in place, and get cracking. Keep walking shoes beside your bed and, first thing in the morning, go for a walk around the block. Or to the corner and back. The next morning, jog a few steps before going back to walking. Swim a few strokes before resting. Then swim a few more. Each time you go to the pool, swim a few extra strokes. Hell, doggy paddle it if you must. At home, use tins of soup or bags of sugar or whatever’s convenient to build up some muscle in your arms. Have a serious re-think because BURPEES ARE THE DEVIL. Now grab a towel and a sweatband and meet me back here on Monday for a progress report.